If you didn’t know already Robert Wise’s seminal sci-fi picture gets an update this week with the Keanu Reeves/Scott Derrickson version. The original film which tells the story of an alien who arrives to earth with a message of peace is, with today's eyes, perhaps too simplistic to stimulate any complex intellectual thought, but it’s still a benchmark in science fiction cinema. And with the help of Robert Wise's solid direction, Michael Rennie's iconic performance and Bernard Herrmann's gorgeous score, this original film is still highly watchable. In the opening scene American military spots an unidentified flying object hurdling toward earth. Alarm bells go off everywhere and the army convenes on the Washington mall to greet it. 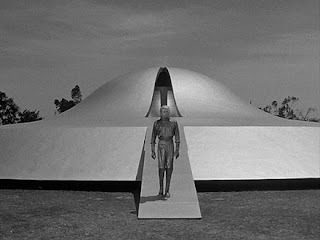 Out of this a classic cylindrical UFO walks a humanoid person, Klaatu (Michael Rennie). But when a triggerhappy soldier shoots Klaatu he’s sent to the hospital. Klaatu’s mission which he explains to the President of the United States is to convene the leaders of the earth to inform them of their irresponsibility with the new nuclear technology. Unfortunately the bureaucracy involved with bringing the countries together frustrates Klaatu. So he decides to wander out into regular society and learn about these strange new people. He rooms with the Benson family and befriends their young boy Bobby (Billy Gray) and his mother Helen (Patricia Neal). When the military discover he’s missing he’s perceived as a threat which creates a conflict thus threatening the entire human race. In this classic studio era, science fiction was perceived as a b-movie genre, films intended for children and matinees. Wise, directing from Edmund North’s screenplay based on Harry Bates’ novel, intellectualizes the science as a means to examine our own social and political frailties. With today’s eyes the lessons taught could be perceived and obvious and on the nose. Indeed there’s little subtlety in Wise’s objective. Unlike other remakes, there’s much more room to open up the story and explore the other details and subplots which emerge in this early version. We don’t learn much about the alien species other than Klaatu’s mission, nor about how he can assume the form of a human. Klaatu’s relationship with the Benson family is well-drawn but Wise inexplicably characterizes the scientist, government and military with little imagination. Wise’s skills as director are apparent though. The Klaatu character, who is initially drawn as a benevolent alien changes ever so slightly revealing a devious and dangerous side in the second half. The final act is anchored by a suspenseful chase with the fate of the earth hanging the balance. When Helen assumes responsibility for Klaatu’s mission those famous words are finally spoken: Klaatu Barada Nikto. Watching old genre films like this requires a filter for the era, as audience became more sophisticated the meaning of this final statement would go between the lines. There’s hope for Scott Derrickson’s new version to better the Robert Wise version. “The Day the Earth Stood Still” is not meant to be a franchise, so let’s hope the producers will settle on and deliver one good film. I am afraid I must disagree with your assertion that a picture like this must be viewed through the filter of the era from whence it came. First of all, it's message is imbued with a universal quality which exceeds the importance of the message itself and in fact is derived from the quiet, thoughtful methodical manner in which Wise spins the tale. Secondly, it is incumbent upon the viewer to do the necessary legwork to appreciate the style AND be entertained by it - not by using a "filter" but rather utilizing careful study of both the period of history AND film history from whence the picture comes. One does not apply "filters" when experiencing Shakespeare or Milton or Joyce, etc. Why should it be different for film? I suppose you could have said that a filter would be necessary for intellectually lazy, uninformed and/or stupid viewers, but that's probably best left to geniuses...I mean, uh...snobs like me. Finally, the remake is so pathetic and mediocre, it's probably best to ignore it altogether and focus far more critical energy upon analyzing Wise's masterpiece. Although not what I expected it was still an entertaining movie. Corey Cotta, Author of All of Yesterdays Tomorrows. There is a clear message in this movie which majority of people will not understand. If you read what David Icke talks about and watch an interview done with Alex Collier, you will gain a better understanding. In conclusion, there are greater forces in this galaxy that don't like what we are doing to this planet. If we don't change, on an individual and then global level. Then we will get eliminated like the movie portrayed.